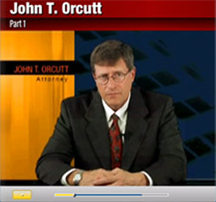 Why choose Law Offices of John T. Orcutt? We are a law firm of 9 attorneys and approximately 60 support staff. We practice exclusively Consumer and Small Business Debtor Bankruptcy law. We offer services in 6 offices, located in Raleigh, Durham, Fayetteville, Wilson, Greensboro, Garner or Wilmington. We practice bankruptcy law before the U.S. Bankruptcy Courts for both the Eastern and Middle Districts of North Carolina. We offer services to clients living in approximately 50 counties of North Carolina. We file approximately 200 to 350 cases per month. We have helped over 30,000 families get free from the burden of debt since 1985. Our goal is to provide the absolutely best quality service possible to North Carolinians burdened with debt. Our goal is to help you and your family get free from the burden of debt. Our goal is to help you lower your monthly payments enough for you to live on what you earn. Our goal is to help you get rid of the stress caused by too many bills. Our goal is to help you and your family get back on your feet. Our goal is to try to put the smile back on your face and the spring back into your step. Our goal is to help you get into a position where you can...once again....look with hope to the future, sleep peacefully and not worry about bills. If these are your goals too....call us. We offer a totally FREE, totally confidential Consultation, where you can get all your debt questions answered and find out all your options. * This result assumes that you also stay in your bankrupty case long enough to get a your final "discharge"